As musicians persist, they can struggle with keeping their ideas coming, they can also struggle to keep their sounds fresh. Seemingly tapped into the antidote of stagnation is Hotel Eden (genre-bending moniker of Florida’s Kelly Warner) and case in point is the latest release “Constellations (I Still Love You)”. Drawing on the longevity of relationships worth fighting for, the hurdles we face in both partner, parenting, and the like, “Constellations (I Still Love You)” is the fresh blend of electro-key-based sound so many have already discovered from Hotel Eden. The ever slightly distorted vocals dance among the upbeat vibes of the space of “Constellations” to set into play yet another a new universe of Eden sound. Where we’ve come to find a great deal of discovery, riddled with gems, this latest single refuses to disappoint. 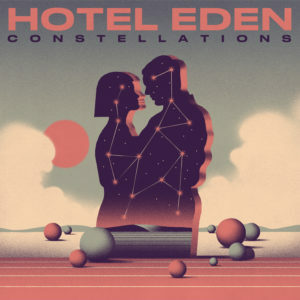 Refusing to fall into complacency, Hotel Eden expands on an already notable presence and releases what will be one half of a two-part release “Constellations (I Still Love You)”. This entry was posted in Singles/Videos and tagged EDM, Hotel Eden, New Release, review, Rock, single, Synth by Greg. Bookmark the permalink.